It's FRIDAY (finally)!!! 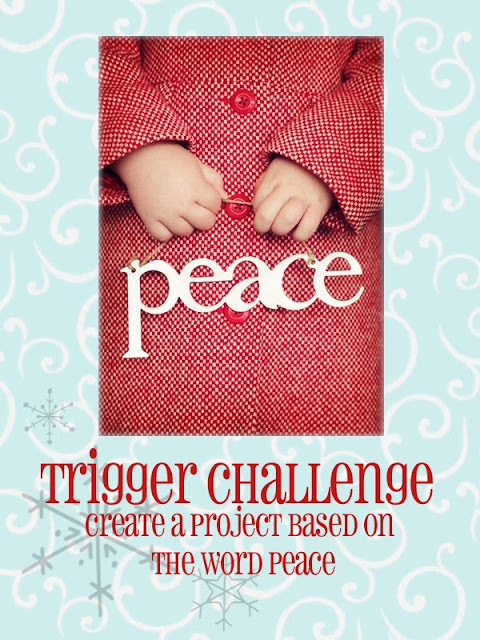 What better way to celebrate a Friday (a holiday weekend Friday, no less) than to play along with a fantastic challenge:) Today, I have the pleasure of playing along with the wonderful Meredith and her crew over at the Festive Friday Challenge! Let's take a look at the inspiration pic, shall we? At first, it was hard not to look at those adorable little hands:) But eventually, I turned to the real focal point, the die cut word. I don't have a die for the word "peace" *yet*, so I used my Silhouette for this one. I cut the word into a a panel that was slightly smaller than my card front. Then I stamped the entire panel with a lovely birch pattern stamp. I wanted a softer background, so I stamped the trees in gray over a lighter gray. Behind the die cut word, I used 2 kinds of glitter (fine white and coarse clear). 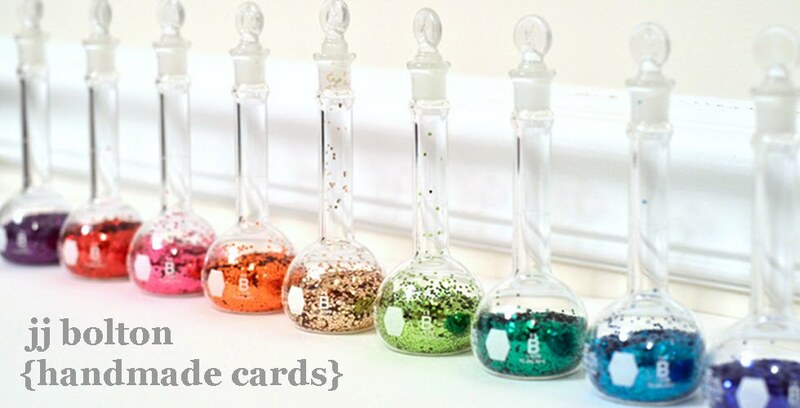 Using two types of glitter on colored paper give you a kind of variegated look. And the glitter seems to jump out at you more because of the contrasting base. I love how it turned out! For fun, I aligned the panel up and to the right to allow for a bit more red to show. And I added a couple tiny die cut red birds to finish off my winter scene. Thanks so much for checking in this lovely Friday! And big thanks to Meredith for the invitation to play along with you and your awesome team! Love that birch background and two types of glitter!?! Lovely!!! 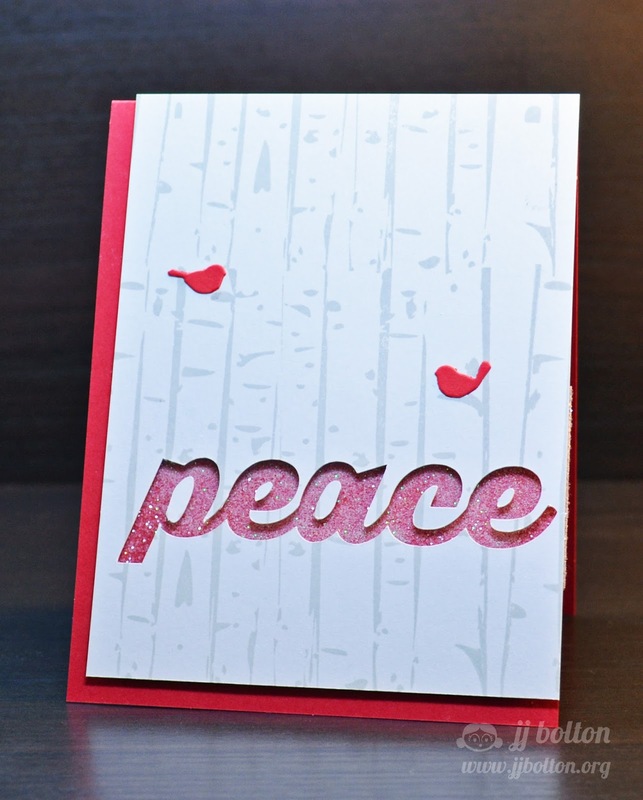 Love the peaceful feel of this card and that mix of glitters looks wonderful. 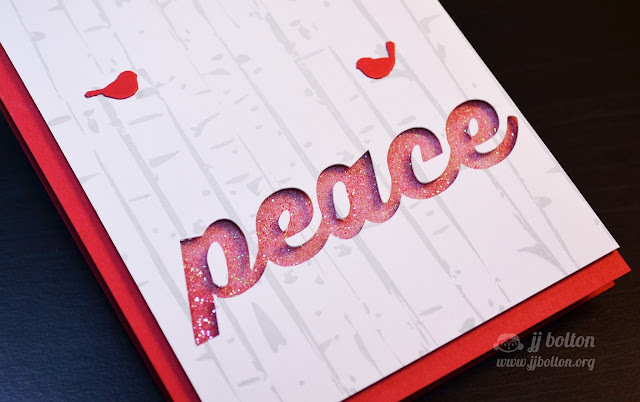 I love your take on the inspiration photo...Beautiful card, and I love all the glittery goodness behind the die cut word! Perfect! Loving the sparkle and those sweet little birds! What a gorgeous card JJ! The tree paper, the glittery word, those little birds - perfection! WOW!!! This is a stunner, JJ! Gorgeous! Beautiful and serene (and even 'peace'ful! lol!) Great to have you as a GD this week! Love this JJ. So beautiful! Avery Elle August Release Coming Soon!